Not too long ago, I saw the above picture of style icon Sarah Jessica Parker (as Carrie Bradshaw) floating around the internet and was instantly inspired to replicate the outfit. 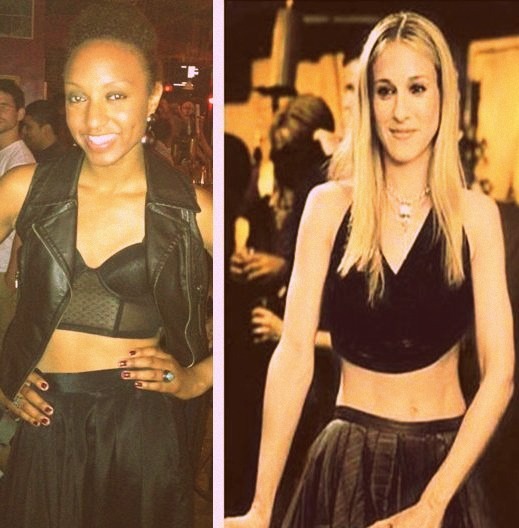 I already owned a strikingly similar black skirt, so the biggest part of nailing SJP's look was the cropped top. Although SJP's was probably Fendi, Gucci or some other brand equal to a month's rent, I'm not quite the label whore she was... my corset top was a mere $10.80 at Forever21 (black is sold out online, but you can find other colors here). Notice that I threw on a motorcycle vest to toughen up the look and tone down the overt sexiness of wearing such a garment in public. What do you think of the look? Are you bold enough to wear a crop top as part of your outfit? Thank you, Anne. I will check out your blog now! LOVE IT. Fierce as usual. You look wonderful. I especially like the addition of the leather jacket; it's just the perfect touch.